For many reasons, that song has really resonated with me lately. And, yes, despite my lack of posting, I am still alive. And so is my garden. Walk with me now and we'll have a little look-see at what's blooming. It's been raining and everything is sprouting by leaps and bounds. 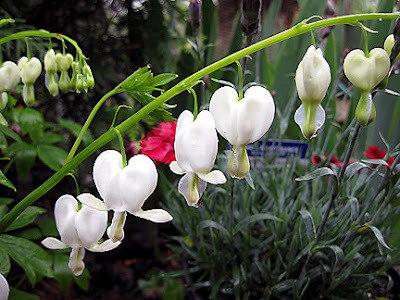 Last fall I dug up a bunch of bleeding hearts from my mom's garden, and was surprised that some of them are white. Aren't they cute? 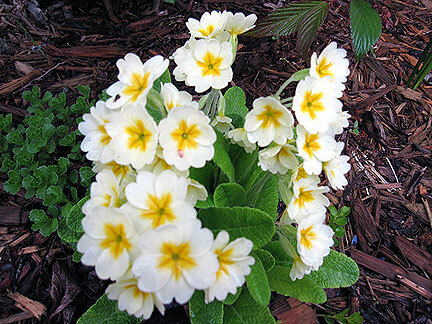 Starting at the front of the house, here are some cute primroses. 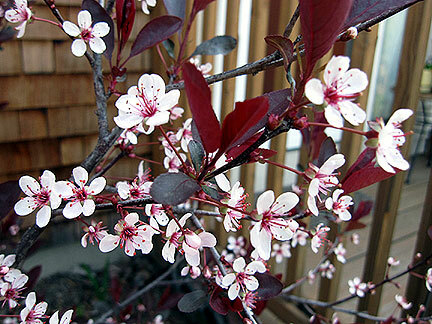 The purple sand cherry outside my front door was blooming when I got home from Chicago. The pale petals are very bright at night. 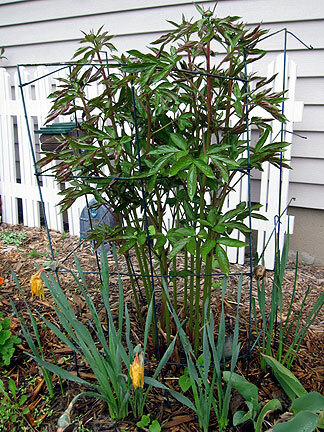 Look how tall the peony is already--they normally bloom in mid June! Aw, my little Geum triflorum finally has buds (waves to Xan and Kylee). PPPP (thanks, Gail!) is doing really well in the foreground, and there's the giant Euphorbia in the background, plus Jimi, Sandy (my car), and Pinky (flamingo). 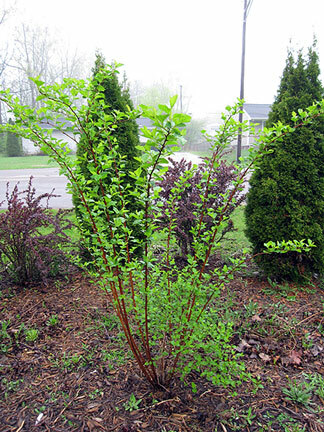 In a long bed that parallels my house and the street, this native ninebark has really taken off. I got it a few years ago looking literally like one small twig. 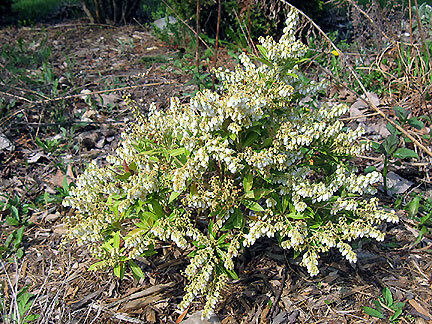 Nearby the ninebark, my little $3.33 Pieris is kicking out blooms and taking names. 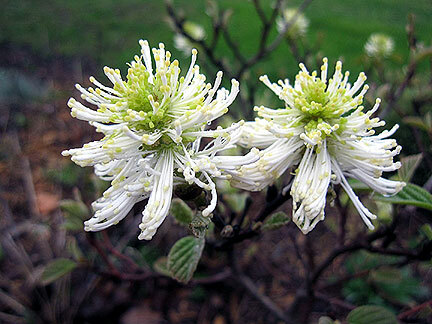 In the same bed, my darling fothergilla is starting to bloom. 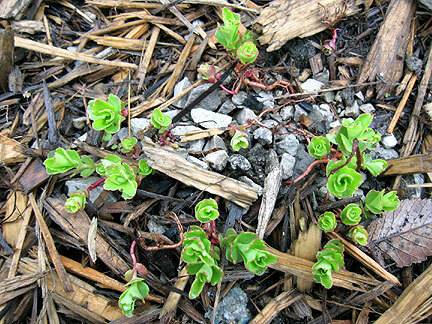 In the xeric bed along my driveway, these little rock garden sedum seem to be doing well. Farther up in the xeric bed, is rattlesnake master, one of my favorite Michigan natives. I just love the leaf margins! 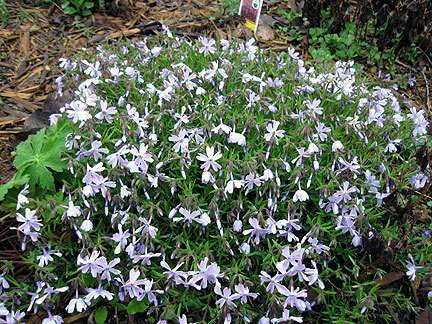 Got the creeping phlox on sale past-bloom last season so I'm happy to see it flower! 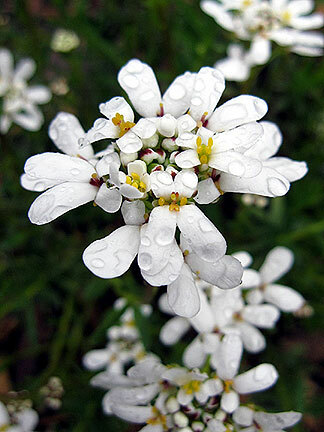 The candytuft was another sale find last year, and I also welcome its first-time blooms for me. 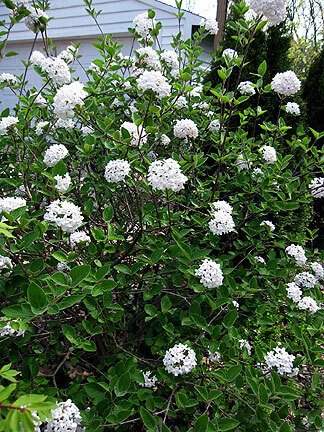 Moving along the north side of the house, and the only boundary with a neighbor, this viburnum smells wonderful! 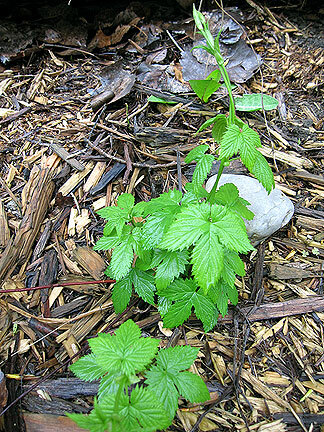 I was shocked to see hops growing near my privacy partition. It was given to me last year but I thought it had died, because no foliage ever came up. Sweet! 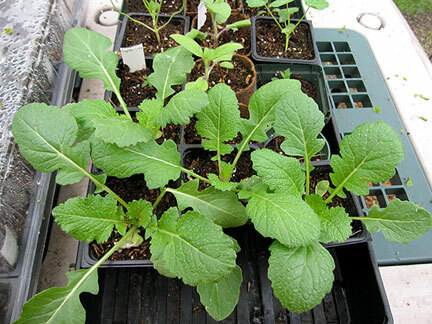 On my deck are winter-sown containers, plus some larger things that have been planted into larger containers while waiting to be planted out. These radishes will go into a container with the baby carrots (thanks, Lisa!) as soon as the carrots are large enough. I got the Bintje potatoes, which were sprouting, planted in a container last week. 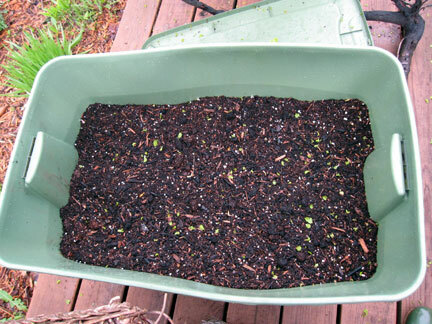 As the foliage comes up, I'll add more soil to the tub. 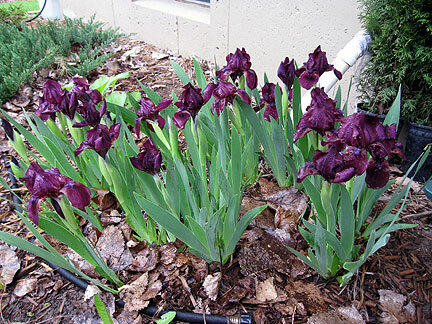 These irises (possibly from Randy) along the east side of my house are blooming very early this year. The cat garden has the most color I have in any one place in spring. 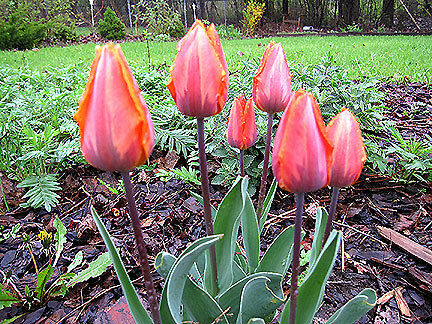 In case you missed it above, tulips! 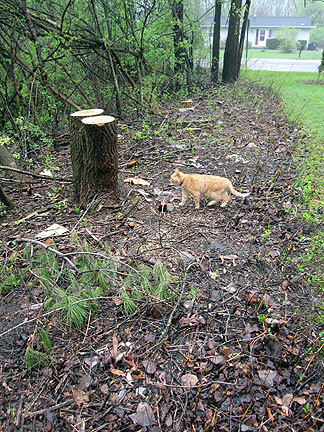 So far this year, no groundhog damage (knock wood)! 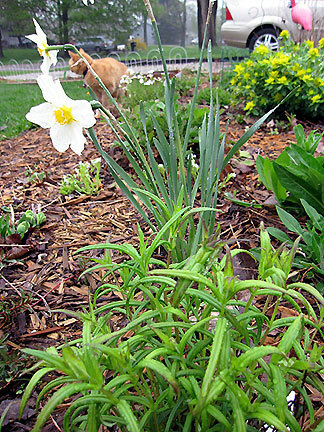 The Valerian in the background is taking over the cat garden (be warned, Sweetbay). Along the north side of my garden, I've had this funky viburnum for at least five years and this is the first year it's flowered. 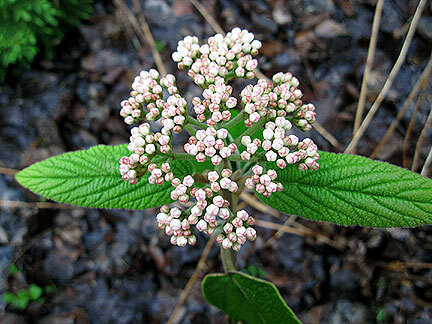 It also seems to keep its leaves all through the winter, unlike any other viburnum I know. 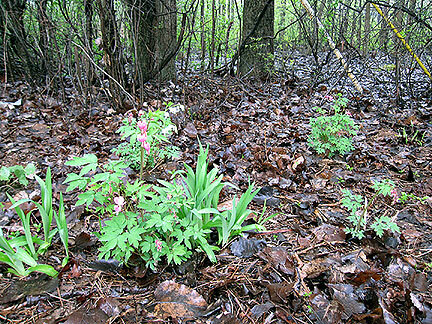 Some bleeding hearts in bloom, plus hosta and lilies coming up, in the east wild bed. Now that so much buckthorn is gone, I have a better view into the park. I'd never realized there was some spring color hiding back there! 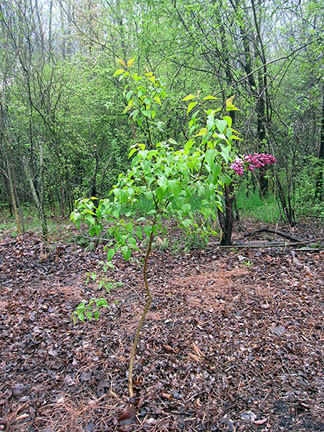 Farther west along the south property line is this little lilac with just one bloom. Also really early this year, usually early June! Farther west still along the same south bed is the area mostly cleared earlier this season by the city. There's still a lot of clearing out for me to do, too. 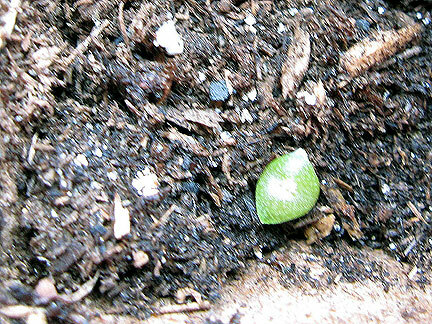 Moving inside, I indoor-sowed a tray of mixed cactus seedlings. By and large they haven't come up yet because my house isn't warm enough. 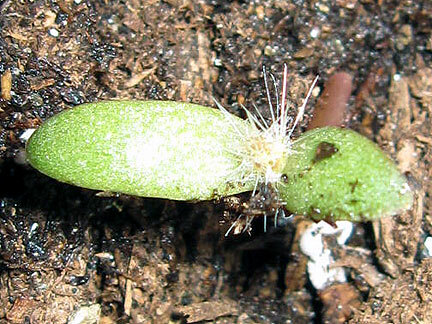 I didn't think this normal-looking cotyledon leaf was a cactus, but now that it's growing spikes, well, maybe it is. This more nub-like shape is more what I expected (sorry about photo quality). 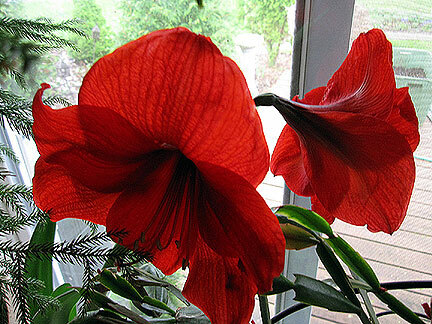 The amaryllis I bought on sale the day after Christmas is finally blooming. Hope you enjoyed your little tour. I'm going to try to post this coming week about other recent fun stuff but... we'll see! ein Traum von weißen Blüten zeigst Du uns. Am allerschönsten finde ich das weiße Tränende Herz. Natürlich finde ich auch Deine Pelznasen immer wieder süß und sehe gern ein paar Bilder von ihnen. There is beauty everywhere in your garden Monica. I enjoyed my tour indeed. You've just put the White Bleeding Heart on my wish list!! Have a great weekend. Hi Monica....nice to see you about again. Your garden is way ahead of mine....how did that happen? Every post I read speaks of everything blooming and being early....here everything is just a little late.I still have daffs in bloom and it is nearly May......odd! Lots of nice blooms, Monica. Hope you had a good time in Chicago and that the trip chased your "Mess of Me" blues away. Seems like we have some of the same non-blooming plants that are suddenly blooming. 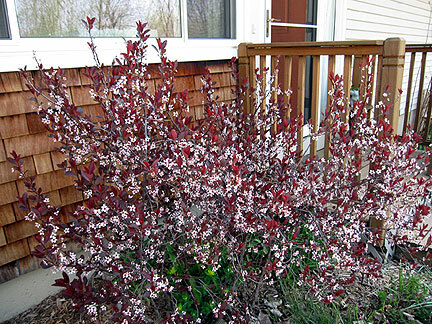 I have a Burkwood viburnum that bloomed for the first time this year. I also bought a few plants out of bloom (creeping phlox, candytuft) but it looks like I may have to wait until next year for their show. 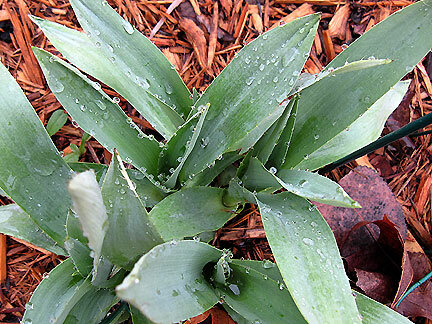 Your tulips and iris are very cool. And that view into the park - very nice! Hi Monica, I looked at white bleeding hearts Saturday. Somehow I got out of the garden center without buying one but after seeing yours, I may go back. 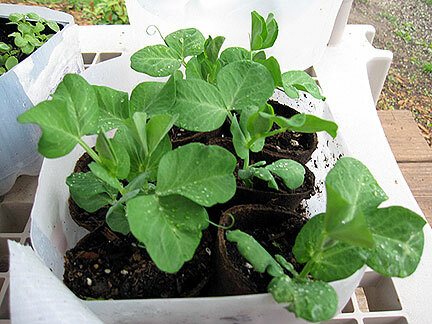 I'm planting out some of my hardier seedlings like sweetpeas and poppies. Our last frost date is May 15 so I'm afraid to set out too much before then. What a wonderful tour, Monica, thanks! That white bleeding heart, and the photo of it, is stupendous! Loved seeing the shrubbies, all worthy of some noogies, same with the seedlings, except maybe the cactus we will just blow a kiss. Monica, help me remember to send you some celandine seed pods when they get ripe. I have a double flowered one (not as showy and the single in my photo). Lots of smiling and nodding here through the little tour. All except Bizi of course. 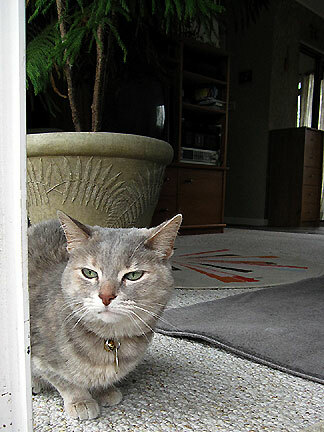 That is one pissed cat. I can't seem to get bleeding heart to grow here. I wonder why. It goes ok for a few years then wham it is gone. Doesn't come back. Very fickle. Not nodding and smiling just thinking about this. Monica, you have so many lovelies blooming! I love the bargin nine bark. What a beauty. And of course the white bleeding heart is gorgeous. 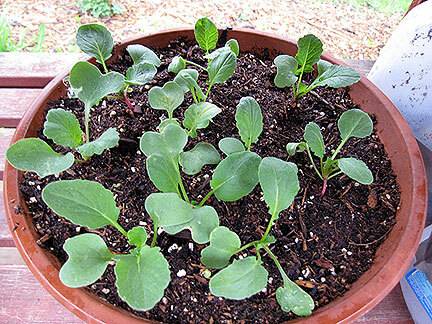 I am also in awe of your winter sowed plants. I am going to try this next year!! Monica I think I recognize where you are and it's not easy. I hope the changes that come with spring make you feel better. 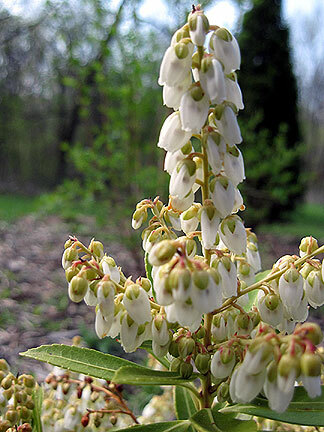 You have so many beautiful white flowers in your garden. 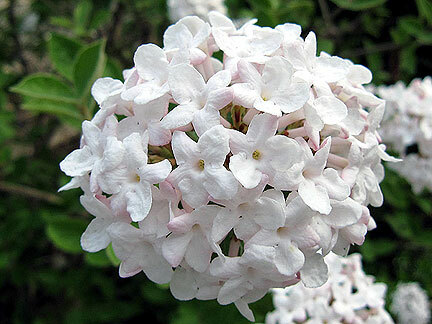 I love the viburnum. 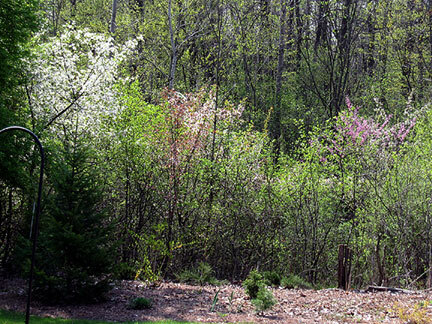 What a lovely view into the park now that the Buckthorn is gone. Fascinating pictures and lovely to see so many in one post. A real show! 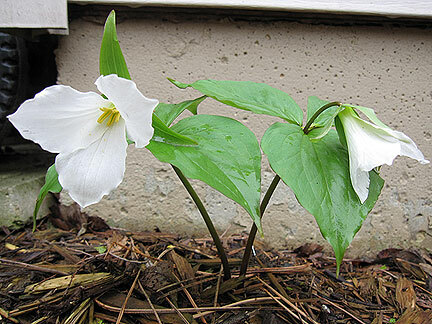 I especially like the trilliums. I have several slowly getting established, here in Eastern England, but they're s-o-o- slow and reluctant. Your white bleeding heart is gorgeous Monica. Your gardens look amazing. I'm sorry for whatever's going on that makes that song resonate, and hope things will be looking up soon. I hope your garden in all its spring glory is soothing your spirit. Lot's of white which is always joyous. Thanks for this tour. What a busy time in your garden with all the blooming going on. I especially love the white blooms. 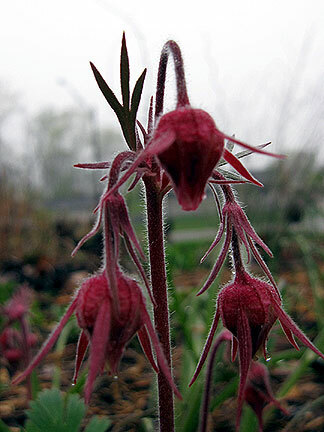 It's a good thing there are a few states between us, or you might wake one morning to find that gorgeous Bleeding Heart missing! Jimi and Fiona are very handsome, I can just imagine that Bizi is too. I'm glad to know someone else names their cars. My first car was Nellie Belle...now I have Chiquita. 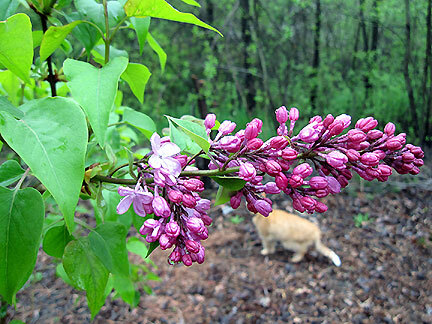 Hope you are over the blues soon...one whiff of that lilac, and you should be A-OK! 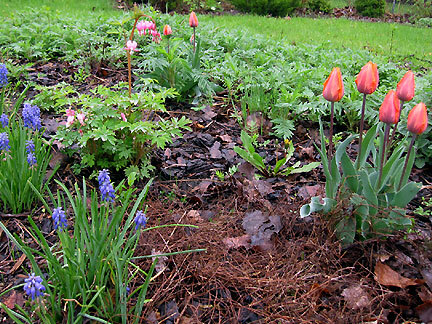 Monica what a riot of color and blooms and activity in your garden! The key must have been the rain that you had...here we are in great need of a good rain.Never did get those April showers!! I see that you also have a line dance of white bleeding hearts!! I posted mine too!I did not get out soon enough to place a cage around my peonies and I see that you did.Mine are about as tall as yours.Guess mine will flop down once the rain does come. Your lack of posting..don't worry about that..I too can't get my posts together now that garden season is here!There just doesn't seem to be enough energy left in me! Have fun in your wonderful garden! It's sometimes hard to figure out how to keep up at times, isn't it? I can identify with the lyrics to that song. I did smile and nod about your sweet white blooms. I have rattlesnake master, too, but it's in a spot that gets watered. It bloomed well last year, and looks fine, so hopefully, it will be OK in that spot.